As you can see in the image above there are 3 easy steps to follow in order to receive $10 free to play with. 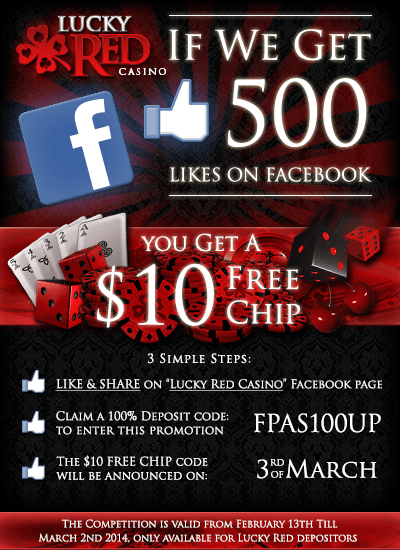 Between February 13th to March 2nd, 2014 Lucky Red Casino is aiming to reach 500 fans on their facebook page. If they reach 500 fans on their facebook page then they will give each person that followed the 3 steps $10 in their Lucky Red Casino account. Step #1) Like & Share Lucky Red Casino facebook page. Click Here to do so. Step #3) You will receive the $10 fee chips code on March 3rd. Also, remember that Lucky Red Casino runs all kinds of promotions on a weekly bases so keep an eye on fun slot tournaments and bonus loyalty comp points. That is all to this social media competition that Lucky Red Casino running.